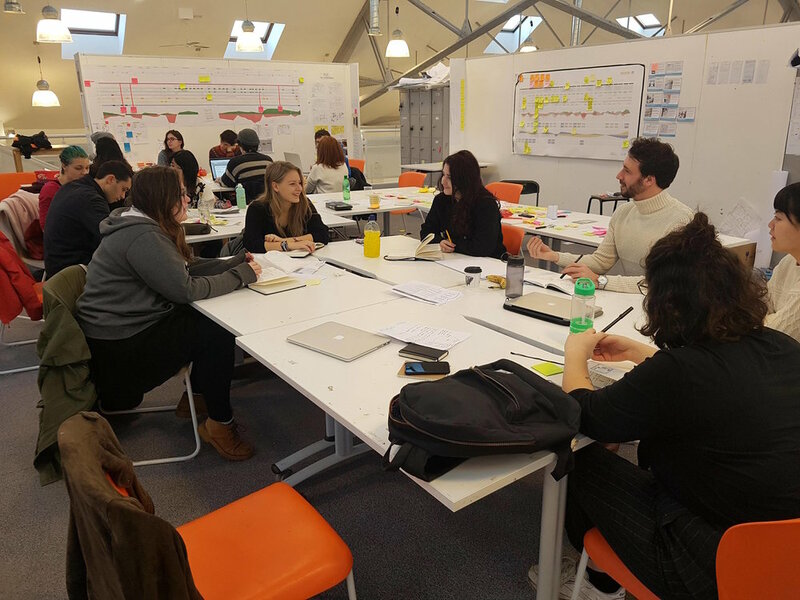 After we did split into mini groups to reanalyse the existent information and get more insights which will further help to identify the actual design opportunities that we are looking for, the group formed by Theodora, Lisa and Stefano started looking at “Emotions and spaces” within the NHS. We began our process by researching more general information about how the spaces look like, what are the patient's reactions/interactions within these areas and how they do influence moods within the whole journey. Furthermore, we did map all the research from both physical and psychical aspects collectively. - Build a clearer understanding of thresholds and their input in a patient's journey. - Understanding specific stops within the journey and how they helped us to come up with a research plan to follow. After a visit to the Western General hospital the previous day we first put all our information on post its and tried to structure it. We generally grouped reassurance into four parts - Stigmas associated with colonoscopies, awareness about the procedure, building trust and support for the family. After a lot of discussing we finally decided we wanted to work on the stigma of a colonoscopy. We then looked at the different types of stigmas that people have. In order to do some more research into the topic we decided to go into a social space. - Men were more uncomfortable about talking about a colonoscopy. Relatives were concerned about where the patient was during the procedure. Sometimes patients cancelled appointments if the could not go into complete sedation in a particular hospital. From our research we gathered that the patient follow had a very positive effect on the patient. We now worked on a way to create a cheap version (paper?) to have that experience available to every patient. So we broke the effects of the students down into emotional support, feedback and distraction and created leaflets with questions surrounding those three aspects. - It is difficult to ask the right questions on paper. Today we organised focus groups with members from each of the hospitals to discuss how the process was going in preparation for our tutorials with Ian in the afternoon. This helped us to practice verbalising our ideas and communicating them to people we had not been working with directly. 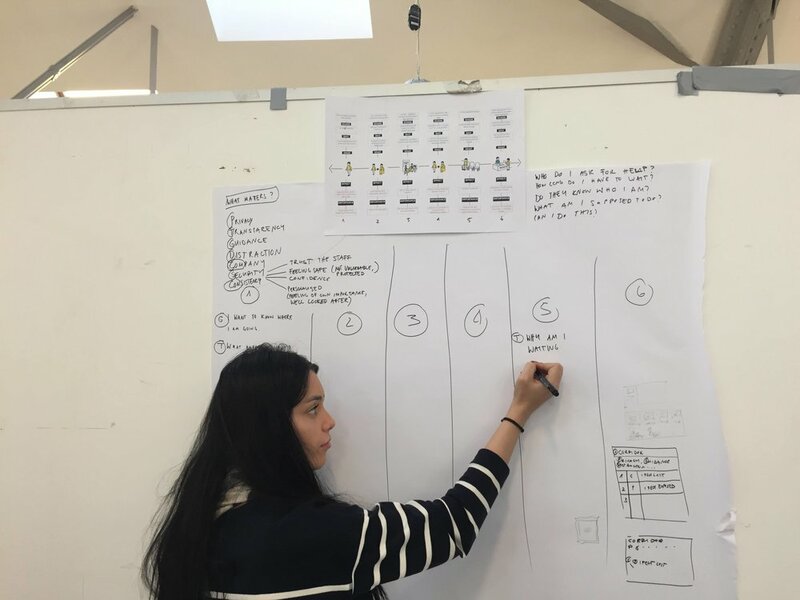 It also enabled us to see the similarities between some of our concepts, so that we could share ideas but also make sure that each group were working on a unique area, that did not contradict the work of another group. - By discussing our direction with another group we realised that a more understanding and holistic approach to reducing cancellations might be more effective than a "telling off". Therefore we decided to change the tone of voice of our interface to better match the empathetic tone of a nurse.